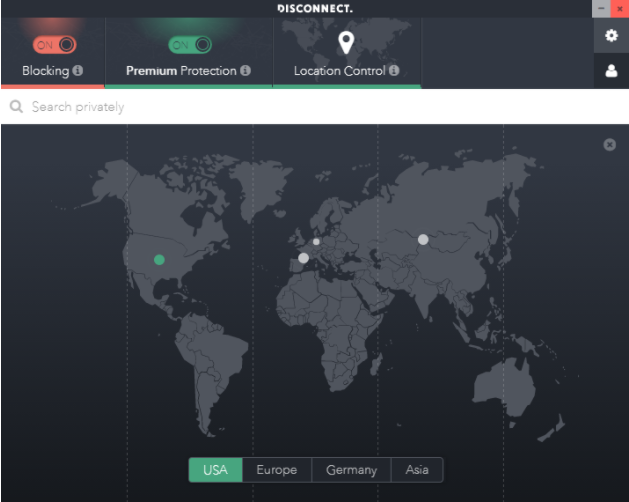 Disconnect VPN is a US-based provider that’s been on the market since 2011. You might know them for ad- and tracker-blocking and safe search browser extensions, but they also offer a capable VPN. Even though there are only four server regions, and it’s not clear how many servers are in Disconnect’s network, the robust encryption and cross-platform support make it a feasible option for beginners and occasional VPN users. As far as VPN is concerned, Disconnect only offers one plan dubbed Premium. 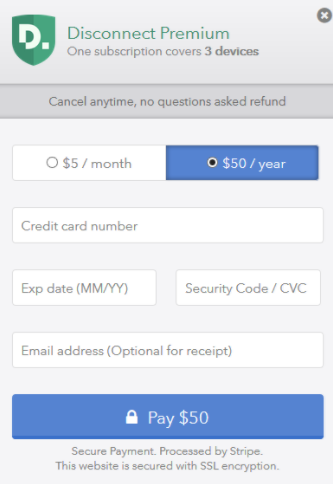 You can choose to pay $5 a month, or cash out $50 for a whole year – very cheap. But the bad news is Disconnect only accepts credit card payments. They also request your email at checkout, and you have to submit it to receive login details. Disconnect Premium allows up to three simultaneous connections and comes with a “cancel anytime; no questions asked” refund guarantee. The other two plans – free and Pro – may have a few nifty bells and whistles that let you do tracker-safe searches. But they don’t offer the VPN feature. This seems like a service that targets novice users who aren’t overly tech- or privacy-savvy. The lack of flexibility in payment methods or support for Bitcoin may be a turnoff for the privacy wonks out there. 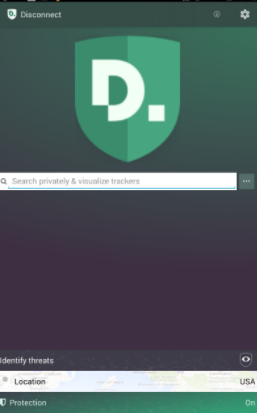 Disconnect VPN is available as a native client you can install on Windows, Mac, Android, and iOS devices, but no love for Linux. It’s also available as a browser extension, which acts as a proxy rather than a VPN. The apps are sleek and easy to use but lack meaningful customizations or information on anything but the four available regions and the number of trackers the app is blocking as you browse. That said, it’s good-looking and suggests zero learning curve, which is ideal if you’re looking for something minimalistic. 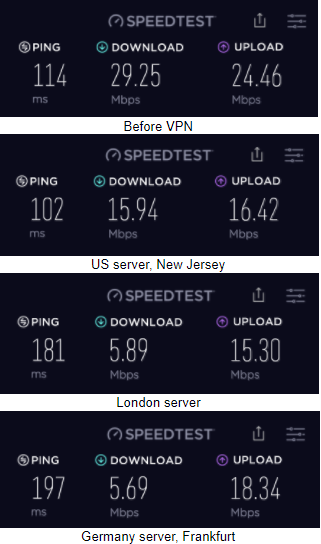 Connecting-disconnecting to VPN servers was smooth. 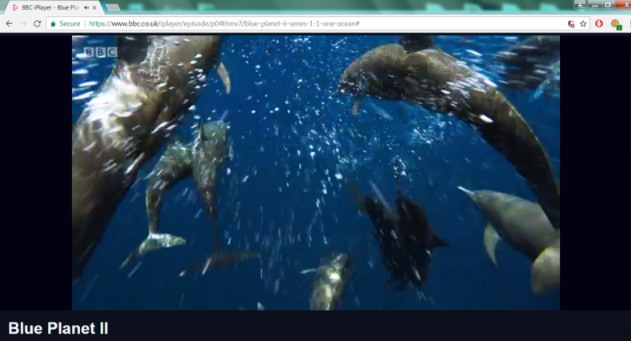 On the downside, the Windows app froze on one occasion and gave me a good scare as my laptop froze with it. On mobile, it performed without hiccups. Disconnect offers a fine collection of detailed FAQs, but the only way you can contact a living being on their end is through email, alas. As I said, Disconnect is a spartan VPN in a way that there is very little to control or customize here but the VPN region. There are four regions you can choose – the US, Europe, Asia, and for some reason, Germany stands apart as if it weren’t a part of Europe. 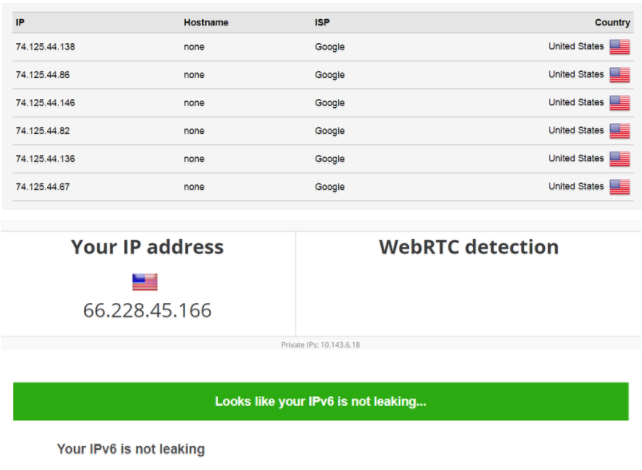 It’s not clear where else in Europe Disconnect has servers – the level of vagueness I don’t appreciate. Whenever I connected to the European region, however, I was assigned a London IP address, so most likely Europe stands for the UK. So, the provider does not disclose the number of servers and their locations, which brings us to the next issue – you shouldn’t be P2P file-sharing because you never really know the servers’ jurisdiction. Disconnect VPN allows up to three simultaneous connections per license. Not much, but just about enough if you need a VPN several times a week for basic streaming activities, or bypassing some regional censorship. 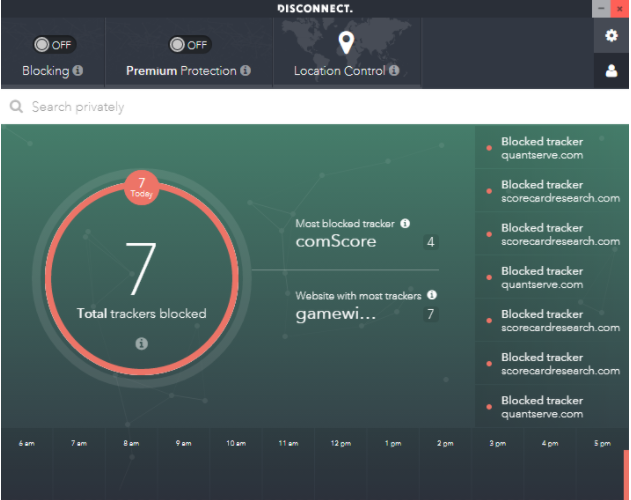 On the bright side, Disconnect’s malvertising blocker is embedded in its VPN, so it will be blocking ads, trackers, and display nifty statistics of all the bad things it blocks on a per website basis. It can be enlightening to discover your favorite gaming site is the one that tracks you more than Facebook itself. On the one hand, Disconnect uses robust AES 256-bit encryption, OpenVPN and IKEv2 (IPsec) protocols – IkEv2 for iOS, and OpenVPN for Mac, Windows, and Android devices. That’s the current golden standard of VPN security. 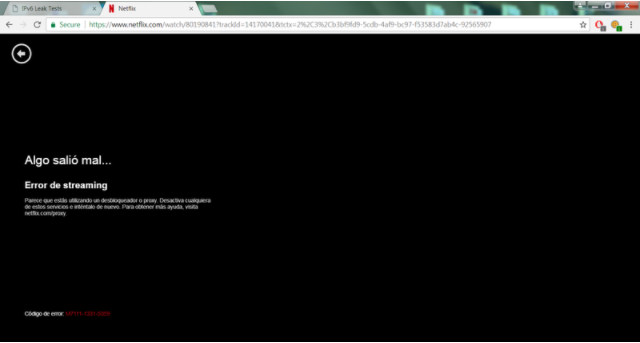 On the other hand, the protocol selection is limited, and there is no sign of a kill switch. But it’s the connection logs and the US jurisdiction alongside the lack of anonymous payment methods that might be a turnoff. If you are seriously concerned about the privacy of your data, mass surveillance and data retention laws wrapped in gag orders, you may want to look elsewhere or avoid US providers altogether. At least that’s what the majority of security experts recommend. 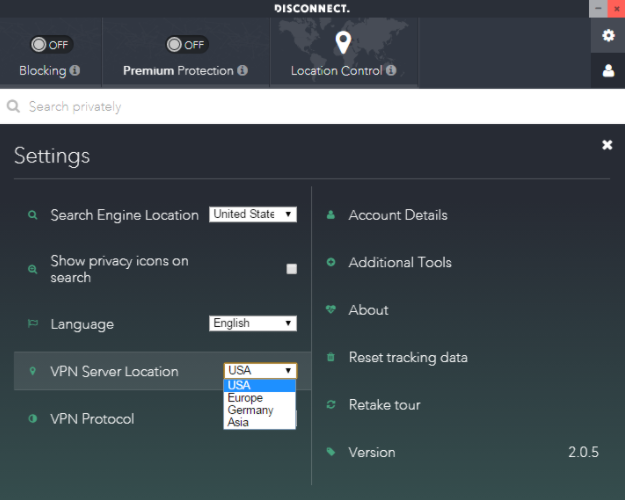 Disconnect VPN is a viable option if you don’t intend to do P2P torrenting, leak corporate or state secrets, or engage in whatever browsing activity that might get you in trouble with the US authorities. Otherwise – and if you are looking for a transparent provider – Disconnect might be too limiting. The undisclosed number of servers and their locations, minimum toggles, some logs, and sluggish speeds won’t be your favorite features.